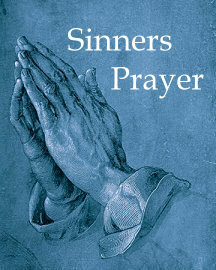 Problems with the "Sinner’s Prayer"
The “sinner’s prayer” is a very popular tradition in evangelical churches. It is so widespread, in fact, that for many it has become an integral, necessary part of the gospel message itself, so much so that any evangelism that lacks it will most likely be regarded with suspicion. For those who don’t know, the sinner’s prayer is a prewritten prayer for salvation that often appears at the end of gospel tracts or is provided by a preacher at the close of a presentation of the gospel message. The idea is that if an unbeliever prays the prayer word for word sincerely, he or she will be saved. I imagine a whole book could be written about this method, but I just want to touch on a few issues. First, the Bible says nothing about it either explicitly or implicitly. This biblical silence on the sinner’s prayer should prompt us to wonder where it comes from. To be fair, though, this silence alone is not enough to make it wrong. After all, the Bible is silent on many other popular aspects of Christian culture, such as Sunday School and Christmas trees, yet we continue with those. Second, this method is a relatively recent development in evangelical circles. Compared to other Christian teachings that have been around for the roughly 2,000 years of church history, the sinner’s prayer is really a new kid on the block—a theological novelty. As such, it was never passed on by the apostles. Not only that, but if this technique were really as vital as many make it out to be, one has to wonder how the church got along without it for so many centuries. Third, it invites the wrong kind of assurance. True assurance of salvation is not based on a one-time prayer made in the heat of a past moment but rather on the presence and increase of spiritual fruit in a person’s life. In other words, biblical assurance stems from a sustained pattern, not a single prayer. If a single prayer gave us assurance of salvation, then we would not be commanded in Scripture to make our calling and election sure by producing an increasing abundance of spiritual fruit in our lives (2 Peter 1:3–11). Just like the seed sower in this parable, we do not know how the kingdom of God grows; our job is simply to sow the seed, not to try to make it grow. That growth comes from God alone. I have no doubt that God is fully able to convert someone through a sinner’s prayer, but I think it must be used very wisely and only in conjunction with certain teaching. Such accompanying teaching should include the following. The gospel should be carefully and clearly explained. The cost involved in following Christ should be conveyed (count the cost!). It should be emphasized that a single prayer cannot be relied upon for salvation. Only Christ can be relied on for salvation, and He must be relied on every day for the rest of one’s life. When the Greek preposition dia is followed by the genitive case (as in the bracketed Greek words at the end of the quote), it indicates instrumentality, the means through which something happens. Faith cannot appease God’s wrath for sin. Only the blood of Christ can do that. It’s the difference between a cause and an agent. To use an analogy, if you are underwater and breathe air through a straw, what is the thing your body needs to remain alive—the air or the straw? It needs the air. It needs the straw, too, but only as an agent through which the air is breathed in. The straw, in and of itself, cannot directly keep your body alive because the straw does not keep your lungs going. It is the air coming through the straw that does that. If you were in outer space and you had a hose to connect you to an oxygen tank, but the tank were floating out of reach of the hose, trying to breathe through the hose would do you no good at all. It’s similar when we talk of faith and the blood of Christ. Faith—like the straw and the hose—is the conduit through which the benefits of Christ’s saving blood come to us, but that precious blood—like the air—is what actually saves. It should be pointed out, though, that like all analogies, these ones eventually break down and can be easily misunderstood. They do not mean that faith is some kind of work that earns salvation. Faith is merely passive; it simply receives. Another analogy is that of an eye: The eye does not create the light or deserve the light; it simply receives it. In addition, faith is not something that a person can do on his or her own. Scripture clearly says that faith is a gift from God; it is not something that one can create inside oneself. Unless I’m misinterpreting this passage, the text does two things, in general: 1) It commands us to make our calling and election sure (i.e., to seek assurance), and 2) it tells us how to go about obtaining that certainty. Since what Peter described here is a process, it seems clear that gaining such certainty is not instantaneous. It is acquired only after developing a pattern of increasing holiness, Christlikeness and maturity. I cannot imagine that God would give anyone assurance of salvation who is stagnating in their Christian life, failing to grow or, even worse, taking steps backward. There is only one proper direction for the true Christian: forward into more and more Christlikeness. If that forward progression is not happening, we have good reason to doubt our salvation.